Ensuring that your installation is a reliable one! In general it's very straight forward to install your BrickRPM module due to the markings that can be found on the back of the board. We still recommend that you read through this page anyway, though, as there are some useful tips, tricks, and pieces of advice presented here. If after reading this page you still have a few questions, don't hesitate to contact us for more information! BrickRPM modules should only ever be mounted inside an enclosure close to the microcontroller which will be receiving the output signals. This is because the output drive is a low current one, incapable of driving the relatively heavy loads required to ensure noise immunity in a 5 Volt square wave signal. In contrast to this, the inputs of the module have very good noise immunity. If you plan to mount the board outside of your ECU enclosure, far from the device that will be receiving the signals, please pay close attention to the section called "Remote Mounting". It contains information which you need to be aware of in order to avoid excessive issues when taking this ill-advised approach. For a permanent installation the best course of action is to solder your BrickRPM module down on some header strips. You should mount it as low as possible to ensure the lowest chance of dry solder joints forming in the future due to vibration. To further help make sure that your install is a reliable one, you can use a blob of RTV silicone under the board; this will lower the stress on the solder joints significantly. For lab use and test use it's acceptable to fix the board to a flat surface by its back using double sided tape. If using this method it's probably better to solder the fly leads to the connection points before sticking it down. Clearly, for a permanent installation that method is not advisable. Be very careful while soldering the connection points as, due to the size of the board, things are very close together. Be especially careful with pins 3 and 6; these are very easy to bridge to neighbouring components and not very easy to fix afterward, should you have that happen. Additionally, the connection points are a close fit to standard header pins. Therefore they must be clean and free of solder when inserting pins, or it will be overly difficult to do so. Power MUST be a clean, regulated, 5 Volt supply. You can usually find this inside of the device to which you're attaching your BrickRPM module. Connect your 5V positive source to the +5V connection point of the module. Connect the associated ground from the same supply to the GND connection point. Note that the output signals will swing between these power rails. Therefore the ground should be common with the device to which you're sending the processed signal. Note, if you attempt to supply the board with 12 Volts, you WILL immediately destroy it. Be sure to only use a clean, regulated, 5 Volt supply with your unit. Obviously connecting the power backwards will have a similarly devastating effect on the IC. Connect the positive lead of your first VR sensor to the VR1+ connection point. Connect the negative lead of the same VR sensor to the VR1- connection point. Connect the 5V tolerant input of your microcontroller to the OUT1 connection point. If necessary, repeat the same steps for the second VR sensor signal with the corresponding VR2+, VR2- and OUT2 connection points. Most VR sensor cables are twin core plus shield in nature. The shield should only be grounded at one end, and not both. If it measures open circuit relative to the two internal cores, then it's safe and indeed correct to ground it to the signal ground within the ECU in question. Assuming that you've used proper shielded cable and routed it intelligently away from high current wiring and other potential noise sources, then the following advice will likely be useful to you. If you've not wired it up as per the advice above, go back and fix that first, before attempting to remedy it with the following technique. If you're still suffering from noise issues post installing everything correctly, you may want to add a shunt resistor to each input. It's OK to add one right from the start, if you desire. It's unlikely to cause any problems, and often helps, or even is a necessary addition. There are two considerations when choosing the value of the shunt resistor. The first is to make the value low enough to kill the noise problems. The second is to make the value high enough to not attenuate the low-voltage, low-RPM signals found especially when cranking on a low battery. The good news is that there is no harm in using a value that is too low, except the inability to start the engine. Therefore it's acceptable to experiment with different values. A good place to start is 1k. Simply lower the value to reduce noise, and raise it to allow low RPM use, such as starting. As a rule of thumb, use a value approximately half of the highest value that reliably eliminates your noise problems for you. Connection of a shunt resistor is in parallel with the sensor and input. Connect one lead of the resistor to the positive input, and the other to the negative input. For example on the first channel connect it between VR1+ and VR1-. 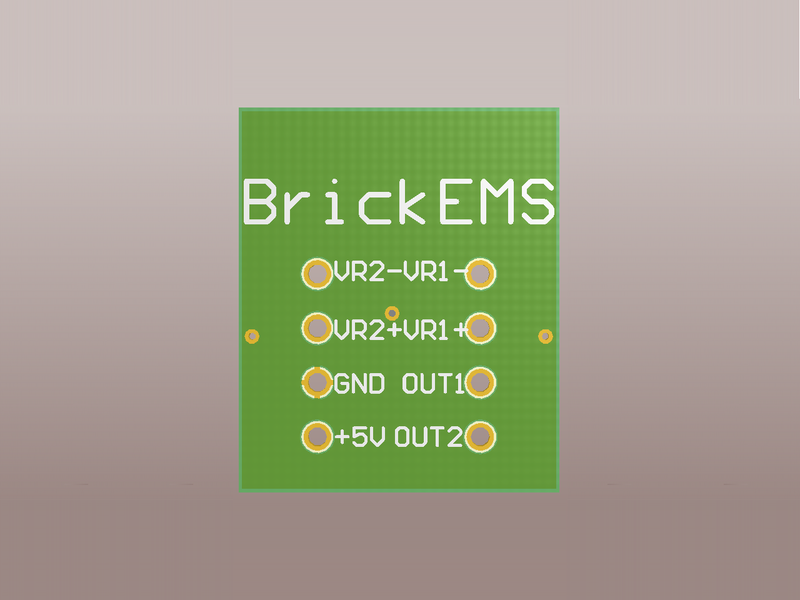 Shunt resistors should be placed as close to the BrickRPM module as possible. It's often convenient to solder them across the back of the connector of the ECU. Shunt resistors should be rated to a suffuciently high power dissipation in order to not be damaged at sustained high RPM. For testing and tuning of the shunt resistor value, you can get away with ordinary quarter watt resistors, however for installation purposes one watt or even two watt is more appropriate, depending upon the value chosen. Advice in this section is given with best wishes only as we do not recommend this approach. If you absolutely must mount it somewhere that isn't inside a shielded case close to the receiving microcontroller, then there are a few recommendations to be adhered to. For each output, place a 1k resistor as a load on the associated input, within the case containing the microcontroller. Putting the load at this end helps keep noise at bay due to induced noise being a relatively high impedance signal, compared to the output of the BrickRPM module. Provide a bulk storage capacitor at the board end of the 5V supply wires. A small, 10V, 100uF electrolytic capacitor will work well for this as the board is already triple decoupled with ceramics. Feed the board and storage capacitor from a convenient remote 5V power supply that shares its ground with the microcontroller that is to receive the output signals. Place the board as close to the signal destination as is practically possible. Mounting the board at or on the sensor is the worst possible thing that you can do; avoid this at almost any cost. Route the output signals from the board very, very carefully; away from all high current wiring and other potential noise sources. If you don't have a convenient 5V source to use, you may wish to obtain a more expensive JBPerf Dual VR board instead as this contains its own power supply. If you do use the JBPerf Dual VR board, the above recommendations still apply, however there is one small catch. In order to load the output signals down with 1k resistors at the ECU, you'll need to remove the 1k resistors on the JBPerf board. This isn't necessary with a BrickRPM module because it uses 10k pull up resistors on its outputs. Failure to do this with the JBPerf board will result in overloading of the Maxim IC if a 1k is also installed in the ECU input. If a 1k is not installed in the ECU input then the signals will be significantly more prone to injected noise than they would be with correct loading. Note, regardless of which precautions you take, and which board you use, we do not recommend remote mounting under any circumstance. It's always better to put it inside the case with the microcontroller. If you follow all of the advice on this page then you're extremely unlikely to have any problems. If anything is unclear or if you have any questions not already covered here, don't hesitate to contact us for more information!